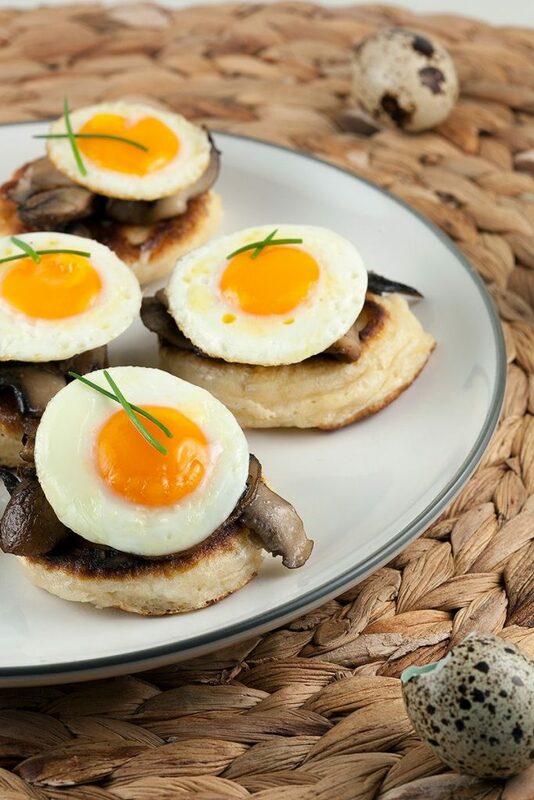 Blini's with chestnut mushrooms and quail eggs do not only look cute, these fluffy pancakes are easy to make too! Ready in 25 minutes. START by preparing the blini batter. Classic blinis use buckwheat flour, but `regular` flour is possible too. 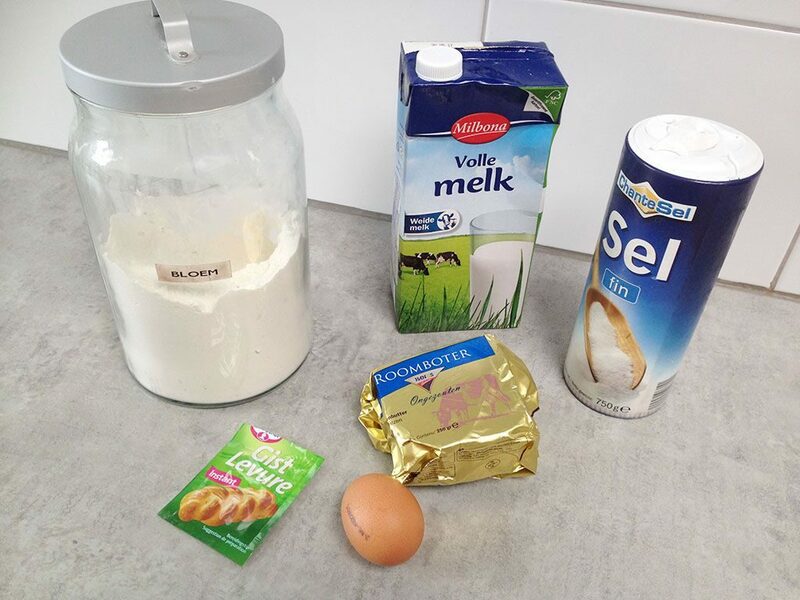 HEAT up the milk until lukewarm, then add in 1/2 sachet dried yeast. SET aside for a few minutes, until quite foamy. SEPARATE egg yolk from egg white and whisk the egg yolk for 2 – 3 minutes. ADD in the yeast mixture and mix until smooth. GRADUALLY add in flour and a pinch of salt while whisking the batter mixture. PLACE the batter on a warm place for an hour to let it rise. CLEAN the chestnut mushrooms using a mushroom brush or paper kitchen towels. PEEL the clove of garlic and chop into fine slices. HEAT up olive oil in a small skillet and cook the mushrooms for a few minutes. ADD chopped garlic and season with pepper and salt. MIX the egg white until stiff and foamy peaks form, scoop this through the (risen) blini batter to make it more fluffy and light. ADD butter in a skillet and create tiny pancakes using the blini batter. COOK for a few minutes on both sides, until golden-brown. COOK the quail eggs for a minute or 2 – 3. 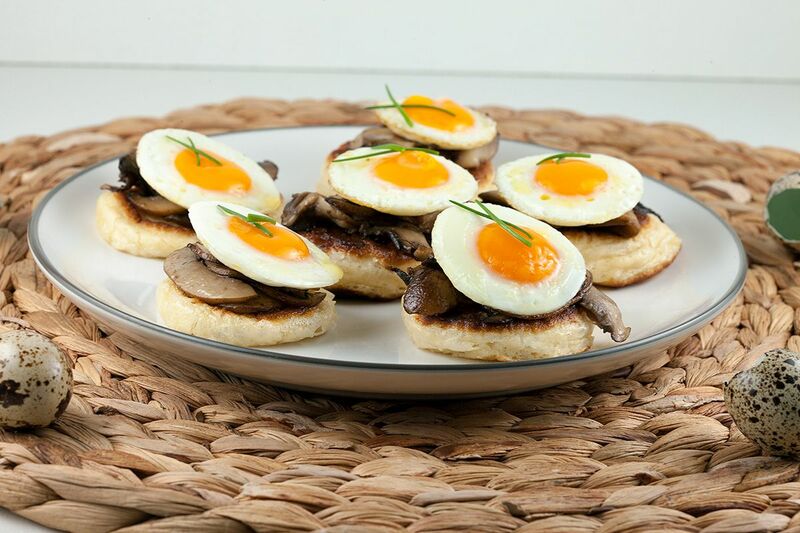 USE a small knife to carefully break open the quail eggs on the top side. USE a poffertjespan or a very small cake ring + skillet to create evenly round blini’s. 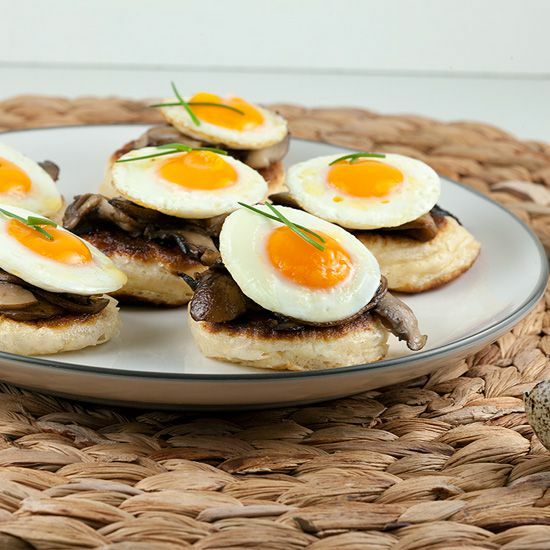 DIVIDE cooked chestnut mushrooms and a cooked quail egg on each blini. SEASON with extra salt and pepper. OPTIONALLY garnish using chives or parsley. Enjoy!